John Poole the founder of primate labs that makes the benchmarking app Geekbench is getting more and more information about the performance of the new 2018 MacBook Pros. 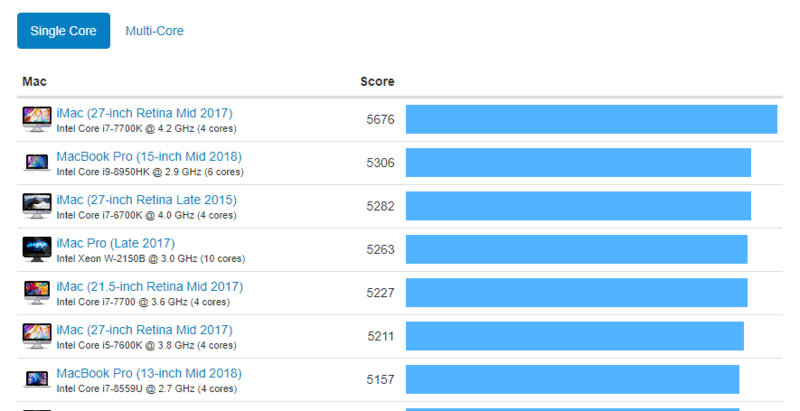 Geekbench 4 is a cross platform CPU and GPU benchmark, and now it has gathered some information about the new Macs from people running the software and submitting the results. The results you see is of todays writing, it may change somewhat as time passes. Not surprisingly the 2.9GHz six-core Intel Core i9 processor, with Turbo Boost up to 4.8GHz nearly tops the Mac benchmark list. In single core it is only beaten by the iMac (27-inch Retina Mid 2017) equipped with an Intel Core i7-7700K @ 4.2 GHz CPU. 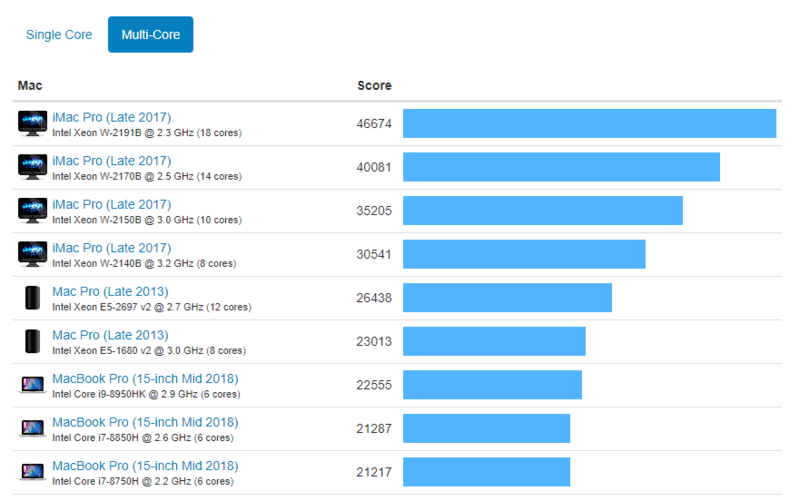 When we check the multi-core benchmark results we (not surprisingly) have the iMac Pro on the top with its Xeon W-2191B 18-core CPU. Still, the 2018 macbook pro benchmark right under the Mac Pro from 2013. The cheapest i9 MacBook Pro starts at $2,799, but this is with a 256GB SSD, 16GB RAM and the Radeon Pro 555X. If you add more storage and ram the price will increase. Benchmarking is fine and all but nothing beats some real world testing. Here is a video from the youtube channel zollotech showing a comparison between the maxed out 2017 model and the maxed out 2018 model with some interesting results! Especially in final cut pro.